Approved aid and refugee organisations can apply for a free license for OPAL. Just think of the many addresses refugees might have until they find a new home. Please contact us, if you would like to use OPAL for a good purpose. We will be happy to consider your request. Please scroll down or select a topic to explore OPAL. In addition to the following summary with some OPAL screen copies, we recommend the OPAL Presentation which provides a more detailed introduction to OPAL with many OPAL screenshots and short explanations. For an overview to the new version please see the chapter News. The sahee Foundation has been working with OPAL since four years (since 2013) to manage our data. As a decentralized working team the program has become an indispensable tool for us. Thanks to OPAL, correspondence and agreements with project partners can easily be understood and supervised (Dossiers), addresses can be managed and used in a simple manner. In particular, we also value the extremely service-oriented work by the OPAL developer Wolfgang Rehfus, who always assists us in case of questions or problems. We can highly recommend OPAL as a database for addresses and dossiers, especially thanks to the service, which goes far beyond our expectations. OPAL is a user-friendly and professional database application for document management, dossier management including relations (CRM), address management and projects administration. OPAL offers an impressive functionality and a so far largely unmatched flexibility. OPAL was internationally designed to provide an excellent and professional solution for both, private and business users alike. The multilingual user-interface (English, German, French* and Italian*) can be selected online at any time. OPAL can be adjusted to the joint and individual requirements of users and is an excellent supplement to Microsoft Office. With the automatic generation of new documents and custom defined standard letters, the support of all international address formats and the integrated functions for communication OPAL is the efficient solution for global use in the private as well as the business area. The OPAL address management enables the professional management of any number of addresses for each person. Auto-dynamic functions simplify data entry. Unlimited relations (CRM) between persons, between projects, and between persons and projects can be defined. By this means entire hierarchies may be represented. 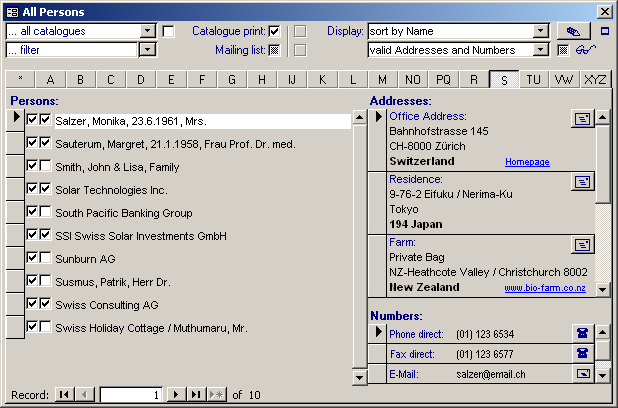 The overview of the OPAL persons and address management displays in the window "All Persons" for each selected person all its addresses with the related numbers. 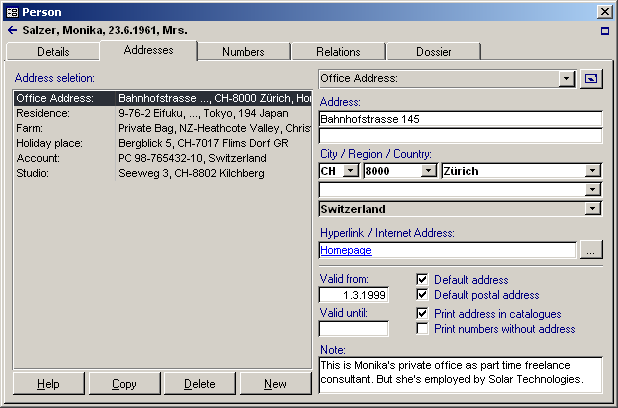 Each person and each organisation may have any number of addresses (e.g. office, residence, holiday, internet addresses) and numbers (e.g. phone central, phone direct, mobile, fax, e-mail). This display provides various sortings, filters (incl. individual text filters for all database fields) and filter options. 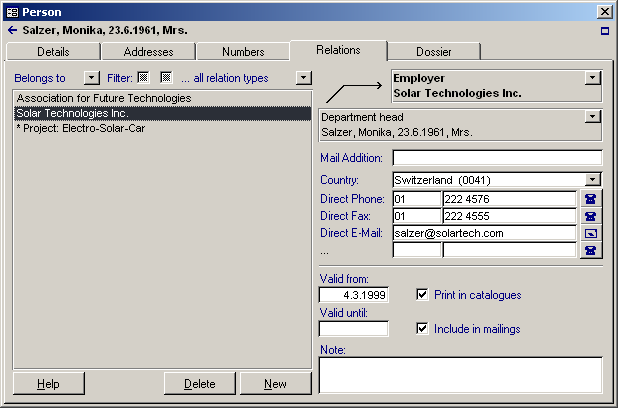 In this picture a company is selected and instead of the addresses, the relations are displayed on the right side. The relations include e.g. all linked employees (with their direct phone numbers and e-mail addresses) and projects. The size of all main windows can be adjusted to individual needs and is slightly enlarged in this picture, to display more entries in the list of persons. Note: Click the picture to zoom and display it in a separate window. Integrated Internet access, e-mail, fax, phone dialler and the fully automatic creation of new letters, faxes and e-mails simplify the daily work load. A double click on any person or address opens the details including the complete dossier with all activities, their related persons, projects and enclosures (see picture below). With the OPAL document management each document is stored only once as an activity. An activity in OPAL can be any kind of document, note, pending file, etc. Each activity (document) is linked to all related organisations, persons and projects. By this means the document appears automatically in all relevant dossiers. That applies to any kind of documents as well as to mail merge letters, which can be created automatically with various options (see next chapter). With various views and filters OPAL provides a complete overview of all activities, pending files, notes and documents of any type (incl. faxes, e-mails and personalised mailing letters). 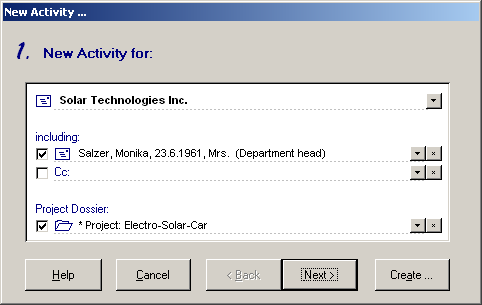 You can view the activities of an selected person or project as shown in the dossiers below, and you can view all activities in the database. You also can view only those activities which are related to your user code (dossier of the user code) or those activities which had been created by your user code. In addition various filters and options are available. Confidential activities are only visible to the owner and hidden to other user codes. The assistant for new activities automatically creates the document of each new activity with the correct address, letter salutation, stationery, greeting, standard texts (if defined), etc. In most situations only the body text of a new letter must be entered. Each activity (document) can be related with any number of organisations, persons and projects. Custom defined letters can be created automatically including stationery and signature. E-mails are generated automatically and formatted with HTML or as plain text. 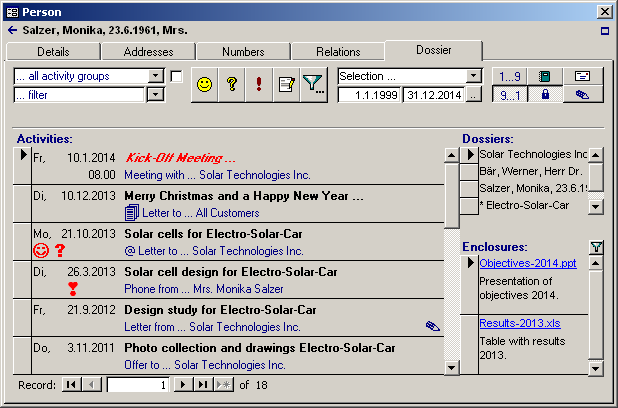 E-mails can be send directly from OPAL (independent from other e-mail clients such as Microsoft Outlook) or via an e-mail client. Enclosures of an e-mail are automatically included as attachments. All Selection list definitions can be fully customised and translated. For example the activity-types (letter to, letter from, phone call, note, meeting with, offer to, contract with, etc.) and the address-types (headquarter, office, warehouse, residence, holiday, etc.) can be defined according to the individual requirements. OPAL manages externally stored documents in all popular file formats (option Hyperlink-Document in the picture above) and additionally offers the possibility to create OPAL-Documents, which are stored internally in the OPAL database. Compared with common text processing systems OPAL-Documents need about 80% less memory on the hard disk. With OPAL you can create personalised mailing letters just as easy as any other document. 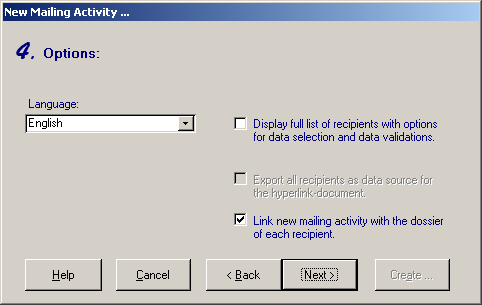 Each mailing activity is automatically linked to all recipients. By this means the mailing letter appears automatically in all relevant dossiers. That applies for printed mailing letters just as for e-mail mailing letters. E-mail mailing letters can be send as plain text or automatically HTML formatted either via Microsoft Outlook or faster and better with the new integrated OPAL E-Mail Client directly via your existing e-mail account (fully independent from Microsoft Outlook). 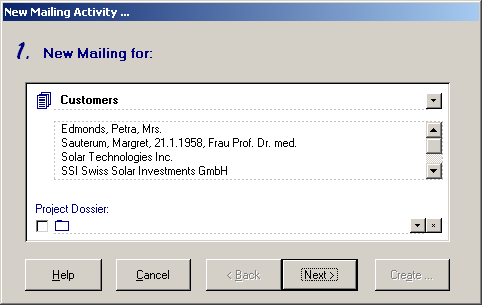 The assistant for new mailing activities automatically creates the new mailing letter according to the selected options. Mailing activities can be created with Hyperlink-Documents (e.g. a Microsoft Word form letter) and OPAL-Documents. 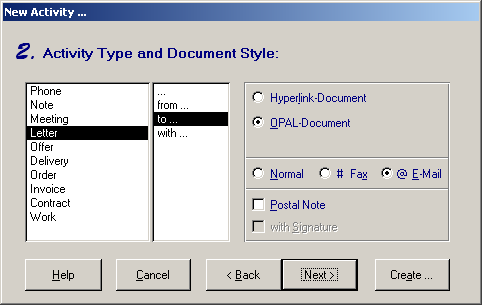 While Hyperlink-Documents provide the full functionality of the text processing system (e.g. Microsoft Word), OPAL-Documents are most effective and simple to create. In most situations only the body text of the new mailing letter must be entered. Note: Click each picture to zoom and display it in a separate window. OPAL enables to define any number of mailing lists. To create a new mailing letter, the mailing list will be selected in the assistant for new mailing activities. 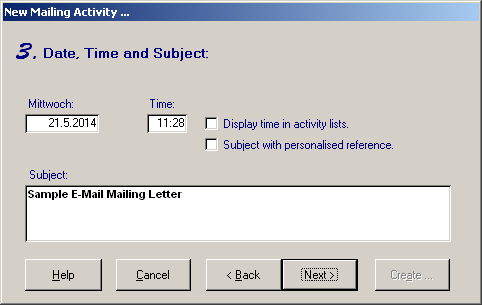 With an option the window 'Mailing Letter - Data Selection' can be displayed, to check all recipients of the mailing list and their addresses with automatic validation functions. E-Mail mailings are simply created by setting the option 'E-Mail' in the assistant for new mailing activities. The OPAL dossier management for persons provides the ultimate overview to all activities. The integrated management of all documents, activities and pending files ensures that the dossiers of all organisations and persons come into being on the fly. Mail merge letters automatically appear in the dossiers of all addressees. The complete dossier of each person includes all activities, documents and pending files of the person. The display of each dossier provides various filters (incl. individual text filters for all database fields) and filter options (e.g. 'all e-mails', 'no e-mails', 'all mailings', 'no mailings', etc.). 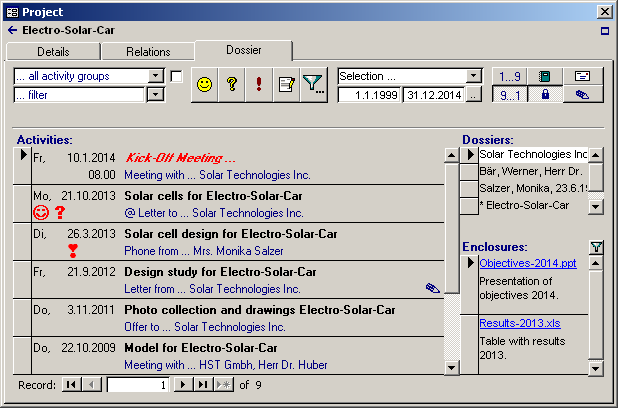 With a mouse click each document and each enclosure can be displayed and edited. Activities can be marked with various priority levels to be an own or a foreign pending file. 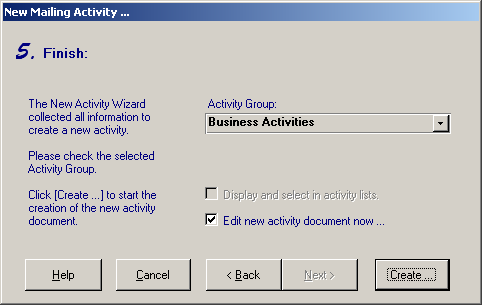 A double click on any activity (or enclosure) opens the document automatically in its application (e.g. Microsoft Word). 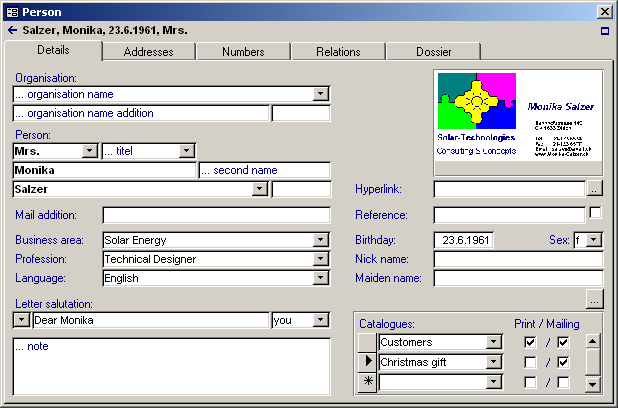 In the same window OPAL provides user-friendly access to all general details of the person (e.g. person names, salutations, photo or business card, birthday, profession, business area, assigned catalogues and mailing lists, etc. ), all addresses (e.g. 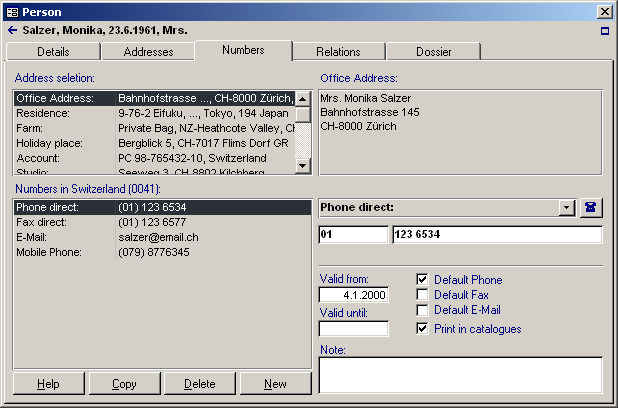 private, office, mail address, holiday, internet), all numbers (e.g. phone, direct phone, fax, e-mail, mobile phone) and all relations of the selected person with other persons and with projects. Due to the integration of all person-details with the dossier of the person (see list of all activities of the person in the picture above) OPAL ensures that at any time you have all the important information at hand. The OPAL dossier management for projects provides the complete overview to all project documents. The integrated management of all documents, activities and pending files ensures that the dossiers of all projects come into being on the fly. The complete dossier of each project includes all activities, documents and pending files which are related to the project. The display of each dossier provides various filters (incl. individual text filters for all database fields) and filter options (e.g. 'all e-mails', 'no e-mails', 'all mailings', 'no mailings', etc.). In the same window OPAL provides user-friendly access to all general details of the project with the project names, start date, description, assigned catalogues, etc. and all relations of the selected project with other projects and with persons. Due to the integration of all project-details with the dossier of the project (see list of all activities of the project in the picture above) OPAL ensures that at any time you have all the important information at hand. The multilingual user-interface (English, German, French* and Italian*) can be selected online at any time individually by each user. Custom definable multilingual selection lists (e.g. activity groups, activity types, catalogues and mailing lists, salutations and letter salutations, address types, number types, relation types, languages and countries) are stored in the database and available to all users. Any number of activity groups (e.g. Business, Private) and activity types (e.g. letter to, letter from, phone call, note, meeting with, offer to, contract with) can be defined. Any number of catalogues and mailing lists (e.g. customers, suppliers, employees, Christmas-mailing) can be assigned to each person. Any number of addresses (e.g. private, office, mail address, holiday, internet) can be defined per person. Any number of numbers (e.g. phone, direct phone, fax, e-mail, mobile phone) can be defined per person. Any number of relations between activities, persons and projects including multi level parent-child-relations (e.g. Holding - company - manager - employee) can be defined. International address formats (e.g. postcode before or after the city's name) are automatically supported and can be predefined for each country. The stationery can be defined with professional headers and footers including pictures and logos. 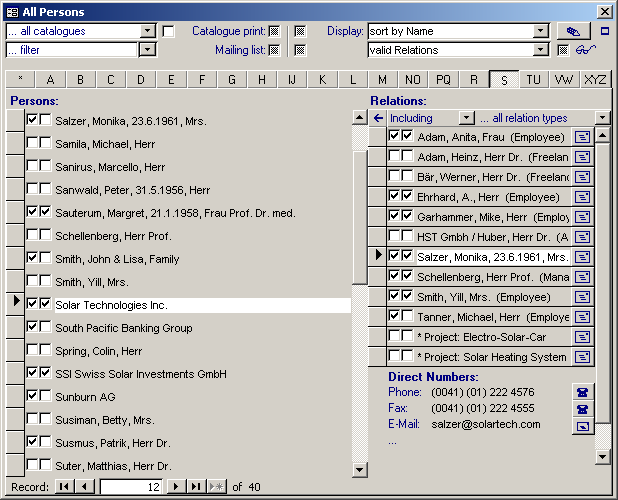 Each stationery can be used automatically for new documents including custom defined default texts. User options enable to adjust OPAL individually to the functional needs of each user. The size of the forms, height and width, can be adjusted dynamically and is stored for each user. Additional adjustable fields in the administration of persons and projects enable to meet individual requirements. These fields can for example be defined with your own descriptions for any kind of usage. These fields can be exported and used in mailing letters just as all other fields. E-Mails can be send fast and direct as plain text or HTML formatted via your personal Internet e-mail account (SMTP), fully independent from other mail clients (such as Microsoft Outlook). Each sent email is automatically archived in all relevant dossiers (linked with activity). Efficient options and filters, which include the full-text search of entire documents, person and project data, ensure that all required information can be found easily at any time. Complex listings for the agenda (Prime Time, Time System, A4, A5, A6) can be generated with various options. Export functions are available to create individual listings and analysis of your data (e.g. in Microsoft Excel). Import functions are available to import e.g. existing address data from any database or table (e.g. MS Excel). Database functions include connecting, compacting, encoding and decoding the database, as well as creating archives copies of the database to store historical data separately and to create additional storage capacity in the productive database. Administration and Security Functions to manage all user codes, passwords, access-rights and installations are readily integrated in the OPAL system. OPAL offers dynamic record-level access rights for the object types activity (document), person (address) and project. The integrated Help-System includes the Welcome Wizard, the Welcome Information, the presentation OPAL Introduction, control tips, situation related and general help functions. In the menu 'Help' the OPAL Users Manual is available as PDF file and there is an additional menu function to open your own customised OPAL help file. The design and the technologies applied for OPAL, ensure that your existing OPAL database is automatically adjusted to new versions of OPAL as soon as you install and run a new version of OPAL. Each new version of OPAL will perform all necessary changes to your existing OPAL database definition automatically and retain your existing data. OPAL is build with proven and tested technology such as Microsoft Access 8.0 and the Microsoft Jet Database 3.0 as well as a consequent modular respectively object oriented software design. New technologies are adopted after being evaluated and tested to ensure continuation and improvement of the quality, functionality and user-friendliness realised in OPAL so far. OPAL can be installed as a single user system on a PC or laptop, as well as a multi-user system on a network / LAN. Please read the document OPAL Installation - Quick and Simple! (914 KB PDF ) before you install OPAL. The OPAL Setup Program provides various installation options. OPAL can automatically be installed on a PC or network client workstation with all necessary files including the Microsoft Access Run-Time Version. Please use the free downloads to obtain the latest OPAL Setup Program. On the first start of OPAL the OPAL Installation Wizard will appear. The OPAL Installation Wizard automatically installs all server files, such as the database and security files, to the selected server destination or connects the new client installation with an existing OPAL database on the network server. For multi-user network installations it is recommended to install computers and networks with a higher performance and capacity depending to the size of the database, the number of users and the number of OPAL client installations. *) For Windows 10, 8.1, 8, 7, Vista please note the instructions OPAL Installation - Quick and Simple! and the article Windows 8 / Windows 8.1 - operation, tips and suggested improvements. OPAL licenses are issued for exactly the required number of users (user codes) respectively installations. Therefore no unused surplus licenses must be paid to use OPAL, as it happens with predefined license packages. The license fee depends on the selected OPAL product (e.g. OPAL Professional) and the required number of users (user codes) and OPAL client installations. Substantial discounts apply for multi-user and network installations. Each installed OPAL license can be replaced and upgraded at any time to enable a changed number of users (user codes) or client installations. Likewise it is possible at any time to change the license from one OPAL product to another OPAL product (e.g. to upgrade from OPAL Solar to OPAL Professional). You can always continue to use an already installed OPAL system together with a new, changed or extended license without the need to re-install OPAL or to re-enter your data. To obtain an OPAL license, you need the form OPAL License-Order, which is available for download. This document also contains the END USER LICENSE AGREEMENT FOR DOLPHIN'S DESIGN SOFTWARE. OPAL is available in different product variations. Please click the desired product for details, pricing and order information. Free version 1) with persons management, address management and project administration. 1) Special conditions apply to support the use of renewable energies. Full version with persons management, address management and project administration. Please note the attractive price overview, take advantage of the Free OPAL Test and the direct OPAL Order via e-mail. In addition we recommend the OPAL Presentation which provides a more detailed introduction to OPAL with many screenshots and short explanations. * The French and the Italian user interface of OPAL is not fully translated in the current version of OPAL and appears mostly in English. Please request an updated version, if you need these translations or any other language for the OPAL user interface.